The flight arrived in Honolulu in the late afternoon. The shuttle to the hotel seemed to take almost as long as the flight. It took over an hour to get from the airport to Waikiki. I woke up early Sunday morning and rented a bicycle to explore the town. The bike pedals kept slipping because many of the gear teeth were worn down, bent, or just plain missing. The ride was so unpleasant that I stopped to turn around and get another bike. As I did, I noticed a woman standing in a row of bushes intently looking at something behind the bushes. 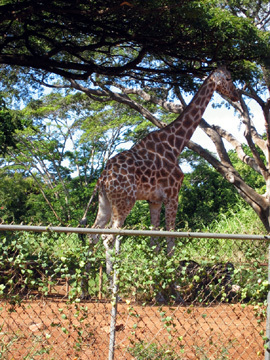 I took a peek and saw this giraffe and zebra. I was next to the zoo!